This study examines the role of occupational status in the racialization of Indian physicians in Southern California. Since the liberalization of U.S. immigration policy in 1965, the number of first and second-generation Indian doctors in the U.S. has grown to nearly seven percent of the nation's physician workforce; however, Indians constitute less than one percent of the total U.S. population. Overrepresented in one of America's most prestigious professions, Indians are more visible in U.S. medicine than in the U.S. at large. Previous scholarship in immigration research, Asian American Studies, and the sociology of occupations has paid little attention to these professional non-white immigrants and their racial experience in the U.S. Asian American Studies in particular has focused primarily on the racial-ethnic identity formation of economically disadvantaged non-white groups, under the assumption that professional Asian Americans’ class status and occupations in the sciences effectively shield them from racist harm and preclude their engagement in racial politics. This research shows that Indian doctors’ high occupational status and class privilege provide them only partial, situational protection from racism. They have what I call occupational citizenship --access to most of the same rights and privileges as whites only when perceived as being both professionally successful and economically beneficial to the U.S. They are clearly marked as occupational citizens during clinical interactions with patients, when they are in the white coat. But outside of this context, they are subject to racist treatment from colleagues, staff, health care institutions, and the general public. The particular forms of racism these doctors face, as well as how they interpret this racism, have as much to do with their gender, immigrant generation, and perception of others’ race and class, as with their own professional class status. These findings are based on fifty-two interviews with first and second generation Indian doctors in Southern California as well as participant observation at the monthly meetings of two regional Indian medical associations. I also observed seven Indian doctors at work, noting their interactions with patients, staff, and colleagues. 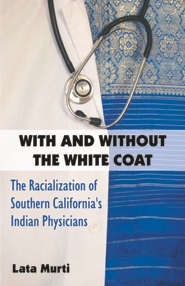 Southern California represents an ideal case for understanding the racial formation of Indian physicians in the U.S. because of its large but dispersed population of established Indian physicians, and its overall diversity of race, ethnicity, and class. Winner of 2015 "Dissertation Excellence Award"
Lata Murti, Ph.D., is Assistant Professor of Sociology on the Santa Maria Valley Campus of Brandman University, and a consultant for the Our American Journey: Many Voices, One Nation exhibit at the Smithsonian National Museum of American History. She received her Ph.D. in American Studies and Ethnicity, with a graduate certificate in Gender Studies, from the University of Southern California in 2010. Her work has appeared in creative, journalistic, online, and academic publications.